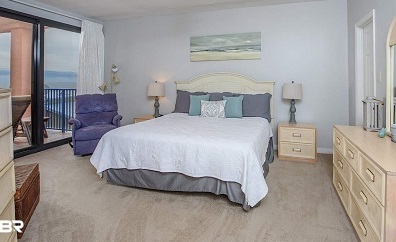 Property Info: 2 Bedroom, 2.5 Bath beachfront unit w/ 1,400+ sq. ft.
Four Seasons beachfront condo for sale in Orange Beach, AL..Very spacious 2 bedroom, 2.5 bath condo in a very unique development. You don't find many 2 bedrooms this large! There are 2 bedrooms with 2 full baths PLUS a half bath. Other property features and upgrades are, granite countertops, tile floors through all the living areas, large closets that offer plenty of storage, flat screen TV's, and the list goes on. Four Seasons offers a private fishing pier right on the Gulf of Mexico! Low density complex! Four Seasons amenities (in addition to the pier) include a large outdoor pool, indoor pool, & fitness center. Do not miss this opportunity!